Oprah opens each chapter by sharing her own key lessons and the personal stories that helped set the course for her best life. 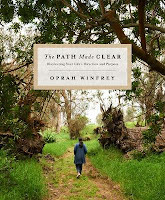 She then brings together wisdom and insights from luminaries in a wide array of fields, inspiring readers to consider what they're meant to do in the world and how to pursue it with passion and focus. Renowned figures such as Ellen DeGeneres, Lin-Manuel Miranda, Brene Brown, Elizabeth Gilbert, Eckhart Tolle and Jay-Z share the greatest lessons from their own journeys toward a life filled with purpose.